Another retail division of The Kroger Co. plans to stop accepting Visa credit cards as a form of payment. Kroger said Friday that its Smith’s Food & Drug Stores chain, with 142 stores in seven Western states, will no longer take Visa credit cards to pay for transactions starting April 3. Smith’s will continue to accept other forms of payment, including Visa debit cards. In announcing the move, Kroger cited “excessive” interchange and network fees being charged by Visa and its issuing banks, saying the cost pushes retailers to raise food prices. The Cincinnati-based supermarket giant said Visa’s fees are the highest of any credit cards accepted in Smith’s and exceed grocery store margins. A Smith's customer at checkout. Smith’s is the second Kroger banner to drop Visa credit cards. In August, the retailer’s Foods Co. Supermarkets stopped accepting Visa credit cards. The Los Angeles-based chain has 21 stores in California. Kroger said it will “continue to explore options” to reduce the cost of accepting credit cards without impacting prices for consumers. The company noted that none of its other store banners are affected at this time. Excluding Visa credit cards, forms of payment accepted by Smith’s include major credit cards such as Mastercard, Discover and American Express; cash and checks; electronic benefit transfer cards from the SNAP and WIC programs; and MasterCard and Visa debit cards (both with and without PINs) and health savings account cards. Through May 21, Smith’s is offering all customers double the rewards points towards fuel purchases, and added savings in groceries and fuel are available for qualifying customers. 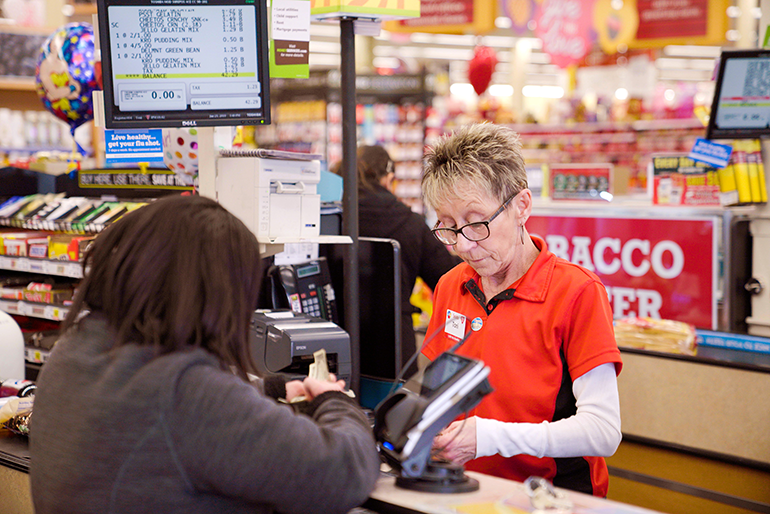 Smith’s operates 55 stores in Utah; 45 stores in Nevada; 23 stores in New Mexico; seven stores in Wyoming; and four stores apiece in Idaho, Montana and northern Arizona. The chain also has 108 fuel centers. Kroger’s announcement comes in the wake of a Wall Street Journal report in mid-February that Visa and MasterCard are slated to raise fees on merchants. As much as 2.5% of prices for goods and services stem from card fees, the Journal report said. And a week ago, the U.S. District Court for the Eastern District of New York announced the preliminary approval of a $6.24 billion class-action settlement by Visa and MasterCard over claims that they charged merchants excessive fees for accepting credit and debit card payments. The settlement will be used to pay claims of merchants that accepted Visa or Mastercard credit or debit cards between Jan. 1, 2004, and Jan. 25, 2019.